state of no change: a state in which there is little or no apparent change in a species of organism over a long period of time. As you might have guessed from the above definition and quotes, in recent days I’ve been ruminating on the nature of change. This is, I suppose, unsurprising given that my immediate friendship groups are currently undergoing a lot of it. Some people have had babies, others are moving abroad, and it’s all a bit, well, unsettling if I’m honest. Which is only natural. If we weren’t scared of change we’d be robots. Anything that alters the comfortable stasis of our lives is inevitably going to wobble our foundations a little. But surely being wobbled is a good thing? I’ve always said my greatest fear in life (besides being attacked by a shark or waking up with a tarantula on my face – those two remain the greatest fears of all) is waking up one day and realising I’ve been doing the same thing for the past twenty years. Why? Because there is SO much to DO in this world; so many places to live, so many jobs to try, so many hobbies to take up. Why wouldn’t we take every opportunity that’s offered to us? Why not make the most of every moment? It’s so easy to get stuck in a rut, to fall into a career that doesn’t grab you and to follow that trajectory to the grave. Making fundamental changes IS terrifying, but sometimes it’s the only way to pull ourselves out of the slough of despond so many of us reside in for our entire adult lives. 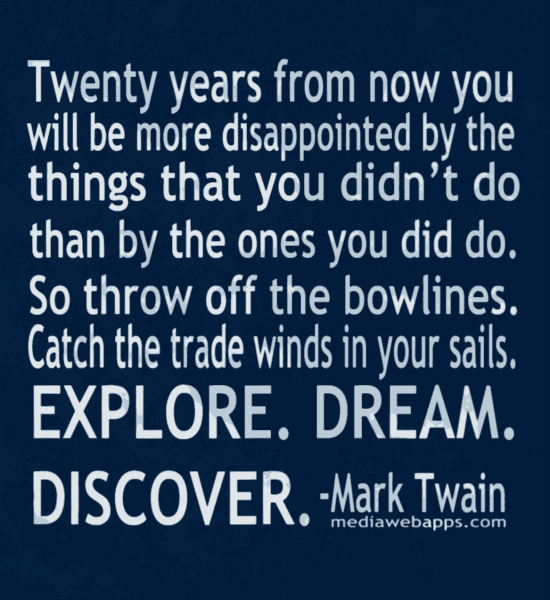 As Mark Twain said, “twenty years from now you will be more disappointed by the things that you didn’t do than by the ones you did.” I don’t want to look back on my life with regrets about the things I didn’t do. And whilst change does scare me, I’m determined not to let it hold me back. I’m also determined to stop worrying about the effect of change on my relationships. Just because a person moves away doesn’t mean your friendship will die. If they’re a good enough friend in the first place, that relationship will thrive no matter where you are. Sure, you might see or talk to that person less, but that just means it’s all the more important to make the times you do see and speak to them count. Life is too short to spend worrying about change and what other people think. Life is for living. And, one way or another, that’s exactly what I intend to do. I’m been watching (for my sins) the first episode of the new series of I’m a Celebrity on ITV, and it’s reminding me of the first night I spent in the Borneo jungle in 2011. 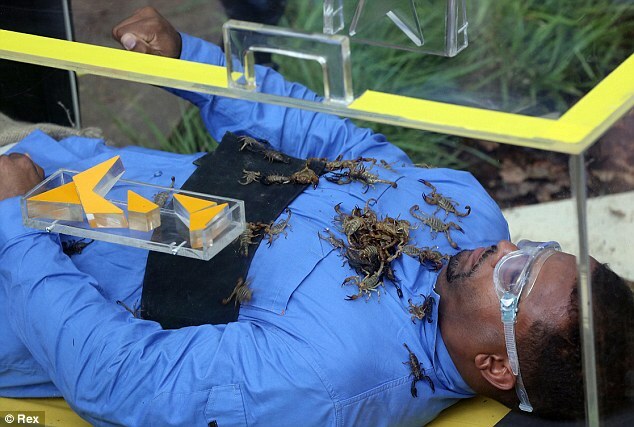 Whilst I (fortunately) wasn’t required to lie in a Perspex box full of scorpions or spiders on that particular trip, I did have a terrifying experience that will stay with me forever. Picture the scene: It’s getting late in the day when a group of weary trekkers decide to pitch camp for the night. The location – on the side of a steep hill dense with undergrowth – is far from ideal, but as the light is fading fast there’s little choice. The group divides into smaller sub-groups who scout out viable locations to put up their hammocks. Some are more capable than others, and it quickly becomes clear the weaker members of the group require assistance from the stronger ones (well, one of the stronger ones and their much weaker tag-along love interest – it should probably be noted at this point the latter two are also members of the volunteer staff team). With due care and diligence the hammocks are erected – all but the final two staff members’. By this point darkness has fallen and all the reasonable locations have been exhausted. After much searching the strong staff member helps the weaker one to put up her hammock, several metres away from the rest of the group in a secluded spot. Once up the girl refuses to test the hammock, confident it will provide adequate comfort for the night ahead. They re-join the group for dinner. Sometime later the girl returns to her secluded hammock and prepares for bed. She brushes her teeth and changes into her pyjamas. As she pulls back the cover and jumps up into the hammock, however, she clearly sees a pair of eyes illuminated in the light of her head torch. Panicking, she turns the light off and rolls into the hammock, hastily lowering the flap. It is at this point she becomes acutely aware that her hammock is anything but level, and the realisation she will spend the remainder of the night clinging precariously to its side hits home. At some point and by some miracle, she sleeps and does not fall out of the hammock. When she awakes, however, it is not morning but the middle of the night, and the reason for her having woken becomes clear – something is prowling around beneath the hammock, cracking twigs and stepping on leaves as it goes. The girl is terrified but stays silent, and eventually the noise begins to fade. At length she sleeps again, but is this time woken by another noise, closer this time, like someone breathing. She lifts the flap of her hammock to find another female staff member’s face directly beside hers, staring without seeing, like a zombie. The girl stifles a scream and retreats into her shelter, offering up a prayer to keep her safe from the hell she has unwittingly entered. It is not until she wakes in the daylight that she realises the second horror was a nightmare. The first, however, was very much real. Tomorrow’s my first official day as a freelancer and I’m excited. I’ve set up a morning meeting with an agency contact who might need to outsource some PR, and will be spending the rest of the day working on a commission for a man whose garden shed product I’m managing the PR launch for. In between those jobs I’m also planning to start working through the exercises in my book on how to pitch feature ideas to publications, and am also keen to start planning out characters and a plot for a new story that’s starting to take shape in my mind. Then on Tuesday I’ll be kicking off week two of the new job by planning a PR strategy. In short, I’m going to be a busy bee! The past few months have been frustrating career wise but I’ve learned some valuable lessons that I’ll put into practice going forward. It’s scary but exciting to go from being one of many communications professionals to the only one; there’s no one to hide behind and if I don’t deliver it’s my head on the block and nobody else’s. But I’ve always thrived on pressure and now have the autonomy I’ve been craving for a long time-both in my main employment and my fledgling freelance career. I’m determined to succeed – because failure just isn’t an option. 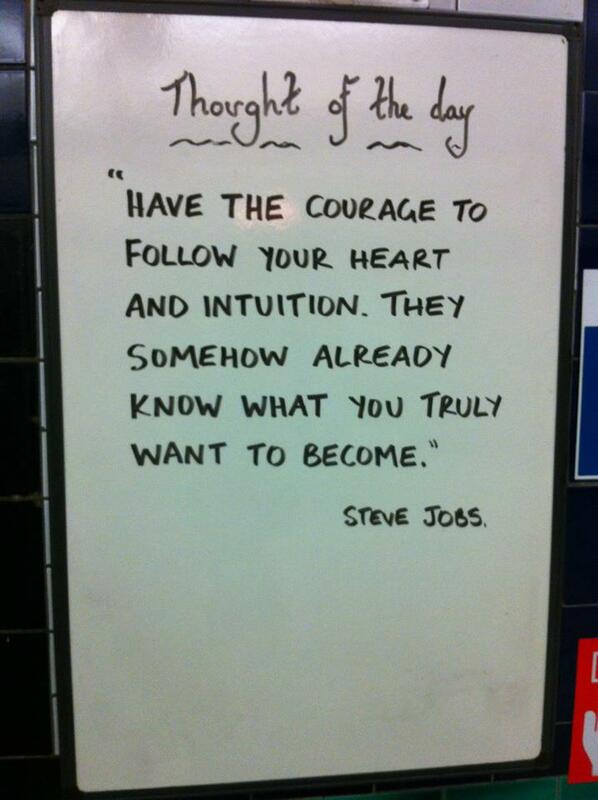 I love the quotes the station staff put up at Clapham North station. This one was taken a while back but is particularly appropriate for today’s post.